Summary: Elsie Wyatt is a born French horn player, just like her father and her grandfather before her. In order to qualify for the prestigious summer music camp of her dreams, she must expand her musical horizons and join - gasp! - the marching band. There are no French horns in marching band (what the heck is a mellophone?? ), but there are some cute boys. And marching band is very different from orchestra: they march, they chant, they . . . cluck? Elsie is not so sure she'll survive, but the new friends she's making and the actual fun she's having will force her to question her dad's expectations and her own musical priorities. 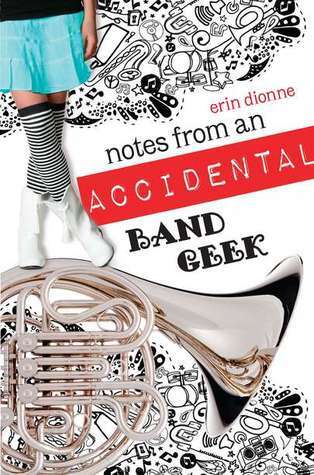 My Thoughts: I still need to read Dionne's other novels! I ended up getting the chance to read this one and was very excited. It sounded like such a cute and fun little read. And it was! We are introduced to Elsie who is a new freshman at a new school. Elsie is a talented french horn player. Her dad is a famous musician and she wants to follow right in his footsteps. In order to audition for a special music group, she must spice up her musical resume a little bit so she joins Marching Band. Her dad doesn't think this is such a good idea. He thinks it will take up too much of her time and distract her. But what choice does she have? She joins Marching Band and meets a few new friends. She actually enjoys her time spent with them and with the people in Marching Band. The one thing she isn't thrilled about at first is playing the Mellophone. She has to play this instead of her french horn since they don't carry heavy instruments around. She does feel overwhelmed at times but she's confident and goal orientated. She wants her audition to go smoothly but she also likes her new life. She finally feels like she belongs to something worth while. And yes, there is a bit of romance throughout the novel. 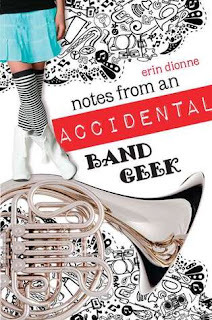 Notes From An Accidental Band Geek was a really cute sweet novel. It brings back memories of high school and makes me wish I could play an instrument, I can't. Overall: I really enjoyed it! This is one of those feel good novels! Yes, there is a lesson to be learned here but its a fun novel. Cover: Its cute as heck! Love the horn! Love her skirt and shoes! Very cute cover. I've been eyeing this book. Thank you for the review. I now want to read this sooner rather than later.